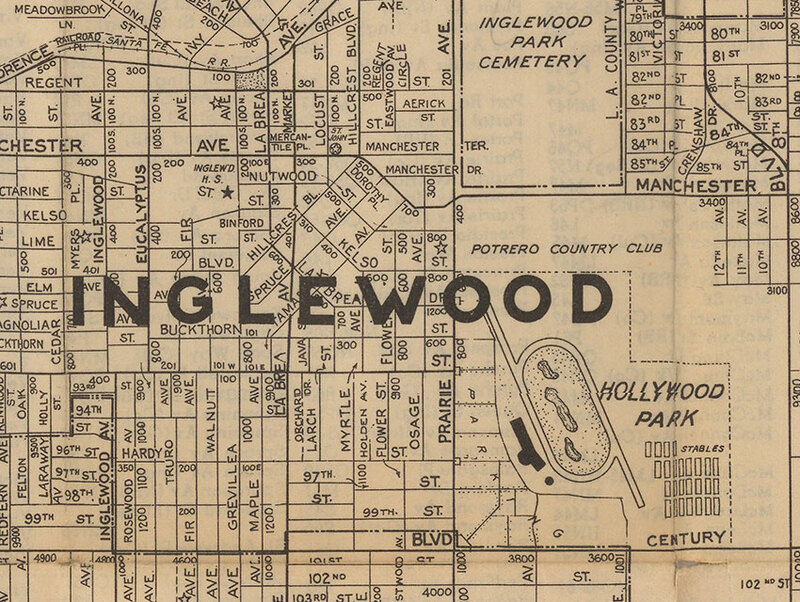 Inglewood has a complicated backstory that dates back to a rather polite land dispute between two families: the Avilas and Machados. José Manuel Orchado Machado was a Spanish soldier and mule tender who was sent west of Los Angeles in 1781 to graze his livestock. He found the area around the Centinela Springs (today’s Edward Vincent Junior Park) to be excellent grazing lands, and he settled there with a group of ranchers. His son Ygnacio Machado went on to build the Centinela Adobe in 1834, a building that still stands as the Centinela Valley Historical Society. Another party—Francisco Avila and his family—had also established grazing lands near the Centinela. Their claim clashed with that of the Machados, and the two families took the dispute to the ayuntamiento­ in 1837. 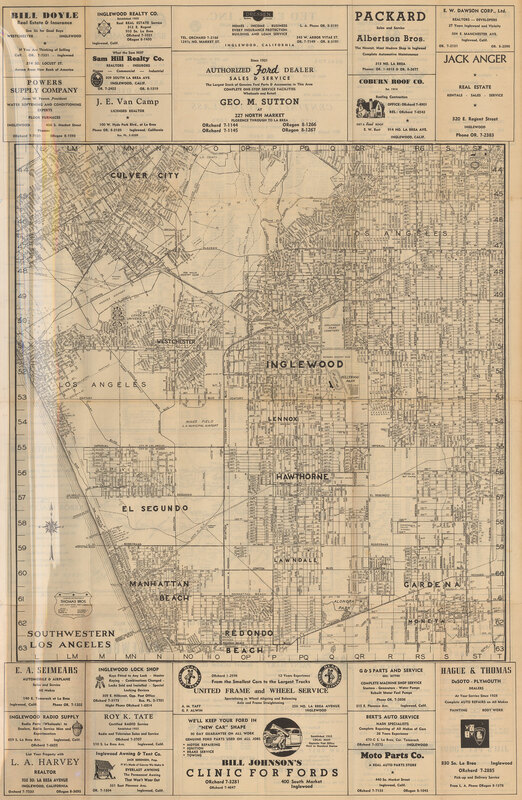 The council gave official title of the area around Centinela Springs to the Machado family, granting them the “Rancho Aguaje de la Centinela.” The Avila family was granted the much larger “Rancho Sausal Redondo” nearby. In 1845 Bruno Avila, son of Francisco, worked a swap with the Machados and got Rancho Aguaje la Centinela in exchange for property in the Pueblo de Los Ángeles (plus a couple of barrels of brandy to sweeten the deal). After California became a state, he petitioned for and was granted official title to most of the land visible on this map. Unfortunately for Bruno, bad mortgages were a problem even in the nineteenth century, and as a result of one, he lost his rancho lands to Hilliard Dorsey—who, shortly thereafter, was killed in a gunfight with a man known as Uncle Billy Rubottam (no, I am not making this up!). Dorsey’s widow tired of trying to manage an estate that was bigger than some counties, so she sold it to Francis Carpenter, who turned around and sold it to his lawyer Joseph Lancaster Brent for the slick sum of $930. Brent then flipped the ranch lands to Scotsman Sir Robert Burnett, who combined it with additional lands he had purchased from the Avilas to create a 25,000-acre estate. When he became homesick and returned to the old country in 1873, Burnett leased the land to Daniel Freeman (for whom Daniel Freeman Memorial Hospital is named), a Canadian expat seeking a healthier climate for his ill wife. In 1885, Freeman bought the land in its entirety for $150,000 and planted thousands of orange, lemon, almond, lime, and olive trees. Venerable Inglewood Park Cemetery was established in 1905, Inglewood was incorporated in 1908, the area was declared “the Chinchilla Capitol of the World” for its thriving chinchilla ranches in 1923, Mines Field was created in 1927, Hollywood Park Racetrack began thoroughbred racing in 1938, and the fabulous Forum threw open its doors in 1967.